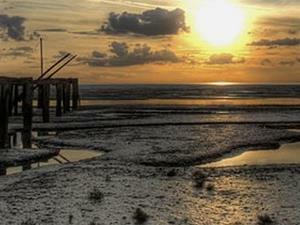 This is one place to witness two of the UK's great wildlife spectacles. On big tides, as water covers the vast mudflats of the Wash, tens of thousands of wading birds are pushed off their feeding grounds and onto the roost banks and islands in front of the RSPB hides. In mid winter, a dawn or dusk visit rewards you with the sight of thousands of pink footed geese flying to or from the overnight roosts. Large numbers of common terns and black headed gulls nest on the reserve in summer, when there is spectacular display of shingle flowers. Please phone to book for coach parties as a height barrier has to be removed to allow coaches to enter the car park. Disabled visitors can drive down to the first hide across a private road by first contacting the reserve office to obtain a permit (can be done in advance by post). No entry charge, free parking. Leave King's Lynn on the A149, signed to Sandringham / Hunstanton and look out for the brown signs on the A149 Snettisham and Dersingham bypass. The reserve is signposted down Beach Road from the A149 Snettisham and Dersingham bypass. Continue down Beach Road for about 1 mile (1.6km) and the reserve is signposted on your left. There is no easy access to the nature reserve because of steps and a rough path. Visitors with limited mobility may drive to the first hide along a rough, gated track through the chalet park - please contact the Snettisham office five working days before your visit to obtain an access permit. From King's Lynn station it is 13 miles to RSPB Snettisham Nature Reserve.